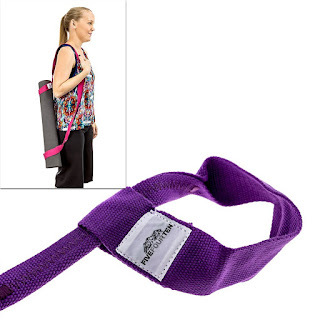 I own a couple of different yoga mats, and recently purchased this Thick Yoga Mat Strap as a way to easily and conveniently carry them from place to place. I got the purple yoga strap which looks great with all of my mats. Even better than the way it looks though is the functionality. Instead of rolling my yoga mats up and stuffing them onto a bag, I can roll them up and secure them in this strap where they can get air instead of being in a closed up area. This allows them to dry out properly and prevents bacterial growth on them. The yoga strap works well for various sizes of mats, so whether I have my thicker mat or the thinner one, I can use the strap with no problems. The strap is sturdy, so I don't have to worry about it stretching or breaking either. This is a good quality mat, and one that I feel comfortable recommending to others.